Nathaniel Hughes and Gavin Salyer sport their respective team’s colors. 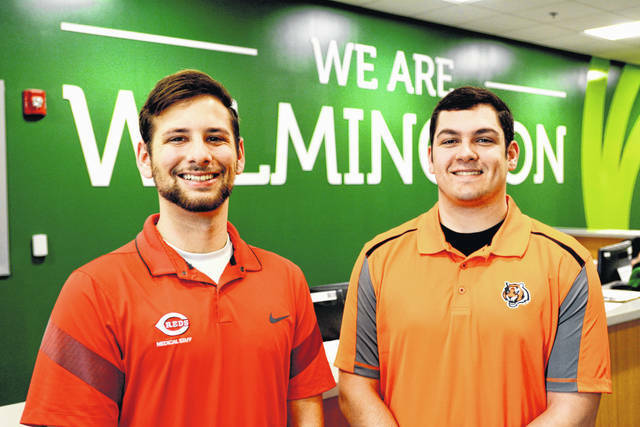 Wilmington College’s presence in the big leagues continues as the Cincinnati Reds and Bengals selected two Athletic Training students to serve as interns during those teams’ 2019 seasons. Nathaniel Hughes, a junior from Carey, is the Reds’ new intern while Gavin Salyer, a sophomore from Richwood, will work in that capacity with the Bengals. Wilmington College AT students have regularly held internships with the Major League Baseball franchise since the early 1990s, when 1994 graduate Nick Kenney interned with the Reds. He became a full-time assistant athletic trainer in Cincinnati and later with the Cleveland Indians, and, the past nine seasons, Kenney has been head athletic trainer with the Kansas City Royals. The College also has a longtime affiliation with the Bengals, which has hosted nearly four-dozen WC athletic training interns since 1981 graduate Paul Sparling became the team’s head athletic trainer in the early 1990s. Sparling has said, “When I have an athletic training intern recommended to me by Wilmington College, I know they’re going to be top-of-the-line.” He annually visits the College to present a Bengals injury case study to athletic training students. With that kind of history, both students feel pressure to perform at the highest levels during their time with the teams. Salyer said he’s been working to secure the opportunity for such a high profile internship since coming to WC. Salyer said his end goal is an athletic training career working with a collegiate or professional team, so this “internship will give me a head start.” He starts with the Bengals later this month and will continue throughout their 2019 season. Hughes began with the Reds the first of April and will continue working all home games through late September — and, pending on the team’s success, hopefully into October. Hughes is no stranger to the athletic training profession, as his father, Craig, has worked as a certified AT in both a hospital and high school setting. Hughes also believes this internship will give him an “upper hand” when he embarks upon a career in athletic training. Hughes feels he’s well prepared to take on the challenges of working with a professional baseball team.